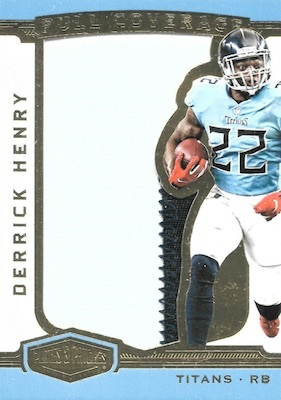 While the name spells out the basic formula, 2018 Panini Plates & Patches Football is not limited to just NFL printing plates and jersey swatches. 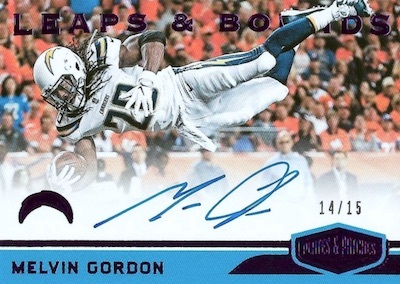 In fact, every Hobby box averages one of each plus one autograph, parallel and base card. The five-card box output is the same as the 2017 set, as is the brand's focus on photography. 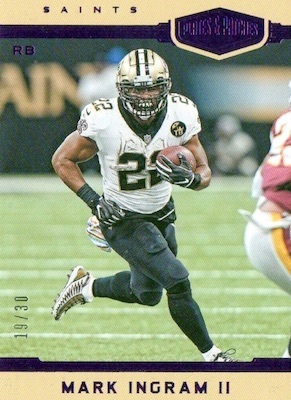 Although base cards generally take a backseat to the hits, the 2018 Panini Plates & Patches Football checklist puts them more on even footing since they fall at the same rate. The base set has 200 cards numbered to 99 copies, and also includes Blue (#/50), Purple (#/30), Green (#/20), Red (#/10), and Gold (1/1) parallels. Each box should have one base card and one parallel. 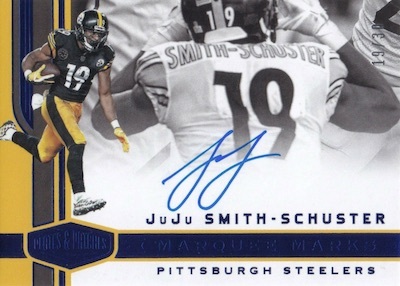 At one per box, the autographs in 2018 Panini Plates and Patches Football take a few forms. RPA fans have the Rookie Patch Autographs line (#/99 or less) with Blue (#/50), Green (#/20), and Gold (1/1) parallels. 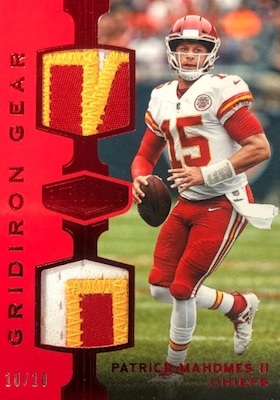 Also likely to garner attention, 2018 Plates & Patches NFL boasts six hard-signed sets. That includes the on-card Leaps & Bounds with some sweet action shots. 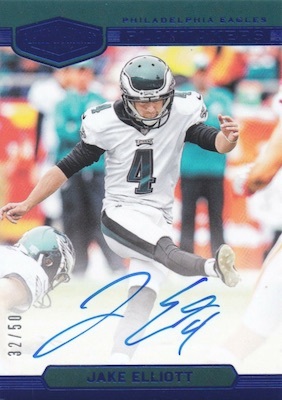 In addition, All Hall is for the Hall of Fame members, Playmakers naturally features standout talent, Signal Callers is only for quarterbacks, and Upper Echelon highlights some of the very best NFL players. Each signed card is numbered to 99 or less, with Blue (#/50 or less), Purple (#/30 or less), Green (#/20 or less), Red (#/10 or less), and Gold (1/1) versions. 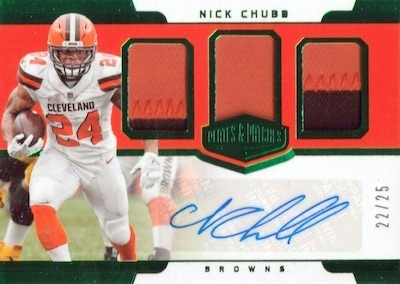 Relic cards are another box hit in 2018 Panini Plates & Patches Football. 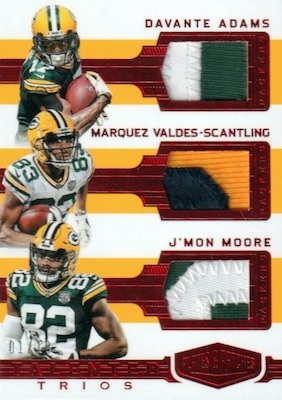 This includes the 30-card Full Coverage (#/99 or less) with jumbo memorabilia pieces, and dual-player Double Coverage (#/99 or less). Blue (#/50 or less), Purple (#/30 or less), Red (#/10 or less), and Gold (1/1) versions add a bit more to the totals, as well. Finally, 2018 Panini Plates & Patches Football supplies one Printing Plate per box. 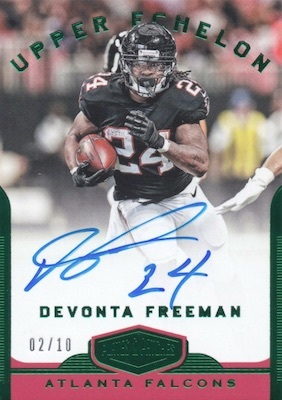 These one-of-one editions are normally from Panini sets released earlier in the year and there are also autographed options. 2018 Panini Honors Ray Lewis Plates And Patches Buy Back Autograph...#ed 1 1!! 2018 Panini Plates And Patches Emerald Auto Jersey Mason Rudolph 17 25! SSP! PARALLEL CARDS: Blue #/50, Purple #/30, Green #/20, Red #/10, Gold 1/1. PARALLEL CARDS: Blue #/50, Green #/25, Gold 1/1. 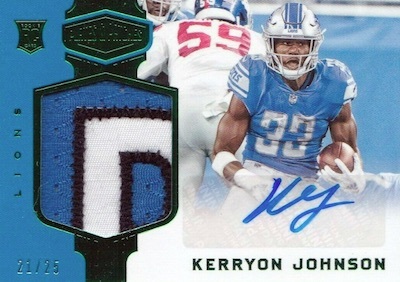 Shop 2018 Plates and Patches autographs on eBay. PARALLEL CARDS: Blue #/50 or less, Purple #/25 or less, Green #/10, Red #/5, Gold 1/1. PARALLEL CARDS: Red #/10 or #/5 (No Coleman*), Gold 1/1. PARALLEL CARDS: Red #/10 or less, Gold 1/1. PARALLEL CARDS: Blue #/50 or less, Purple #/30 or less, Green #/20 or less, Red #/10 or #/5, Gold 1/1. PARALLEL CARDS: Green #/20 or less, Red #/10 or less, Gold 1/1. PARALLEL CARDS: Blue #/45 or less, Purple #/20, Red #/10, Gold 1/1. PARALLEL CARDS: Blue #/45 or less, Purple #/20 or #/15, Red #/10, Gold 1/1. PARALLEL CARDS: Blue #/50 or less, Purple #/20 or #/10 (No Gurley*), Red #/10, Gold 1/1. PARALLEL CARDS: Blue #/35 or #/10. 1 per box. Serial numbered 1/1. 390 cards. Serial numbered 1/1. View the 2018 Panini Plates & Patches Football Checklist spreadsheet. Do you have a question about this insert? So far…this is awful. 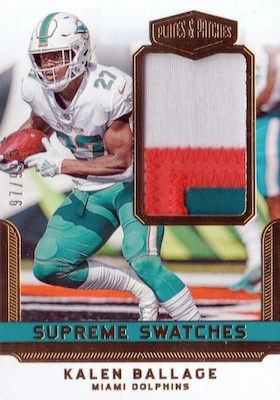 It literally has patch autos without the auto so you have a big white space. They are just underwhelming and disappointing. Not a great product. Do you know if there is a retail version for target or Walmart? 2018 PANINI PLATES & PATCHES FOOTBALL HOBBY BOX FACT SEALED 3 HITS PER MAYFIELD?